Matthew Chen's study, first published in 2000, offers a most comprehensive analysis of the rich and complex patterns of tone used in Chinese languages. Chinese has a wide repertoire of tones which undergo often surprising changes when they are connected in speech flow. The term tone sandhi refers to this tonal alternation. 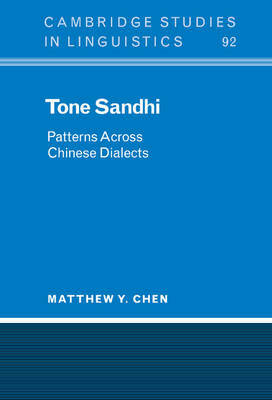 Chen examines tone sandhi phenomena in detail across a variety of Chinese dialects. He explores a range of important theoretical issues such as the nature of tonal representation, the relation of tone to accent, the prosodic domain of sandhi rules, and the interface between syntax and phonology. His book is the culmination of a ten-year research project and offers a wealth of empirical data not previously accessible to linguists. Extensive references and a bibliography on tone sandhi complete this invaluable resource which will be welcomed as a standard reference on Chinese tone. Buy Tone Sandhi by Matthew Y. Chen from Australia's Online Independent Bookstore, Boomerang Books.